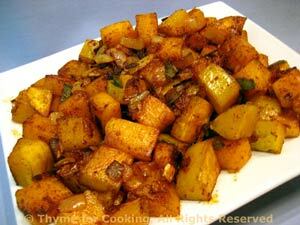 Fried Butternut Squash, simple, seasonal, Thyme for Cooking vegetables. Butternut squash, onions and sage, fried to a golden brown... A simple preparation for this savory fall vegetable. Finish with a bit of fresh pepper and sea salt. Slice butternut squash, (.5", 1.25cm) then cut into bite-size cubes. Heat butter and oil in a large, nonstick skillet over medium heat. Add squash, onions and sauté 10 - 15 minutes, until squash is nicely browned. Snip the sage leaves into large pieces if using fresh. Sprinkle squash with sage, paprika and sauté 5 minutes longer. Serve.